Louisville has looked good this year, but not that good. Wasn't Christian Hackenberg supposed to be good? Well he does have the talent and I think he'll show it against the Terps. The Hokies really aren't that good at all, hence their last place position in the Coastal, but they still should beat the Eagles at home. The Wolfpack have looked terrible of late. At least teams struggle to score against the Orange. So this has turned out to be a relatively big game in the Big 12. 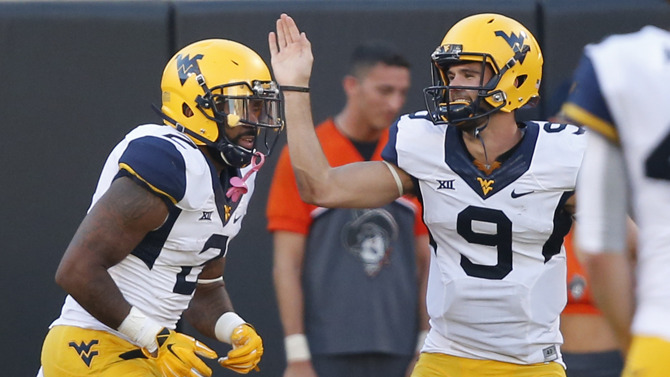 I have been impressed with Clint Trickett and the Mountaineers, but color me a believer in TCU. Well this isn't any fun. The sinking continues for the Cougars. Maybe Florida can keep it close, but let's keep it real. This will be an interesting pick for me and I'll let you figure out why. Kentucky looked solid against Mississippi State at home and the Tigers are atrocious offensively right now. A key game in the Belt right here. These clubs are relatively even so I like the Cajuns at home with that homefield advantage. Ole Miss was a disappointment last week but it's tough to play in Tiger Stadium at night. But how did South Carolina stick with Auburn at Auburn? Give me the Rebels to get back on track. Texas Tech can't stop anybody right now. The Horns get the win. The Gamecocks showed some life this past weekend, and they'll get a win this weekend. This Cardinal offense is pitiful, so it's going to be tough for them in Eugene. They better hope their defense is clicking. If the Wildcats could make a field goal, they'd be undefeated. They'll host the Pokes in Manhattan, and Okie State looked pitiful these past two weeks. UCLA struggled to beat Colorado, and were taken to overtime nonetheless. Even in the Rose Bowl I've got the Wildcats. Maybe the Aztecs are actually legitimate? They could've pulled a typical ASU last week but they took care of business against U-Dub, and I like them here.